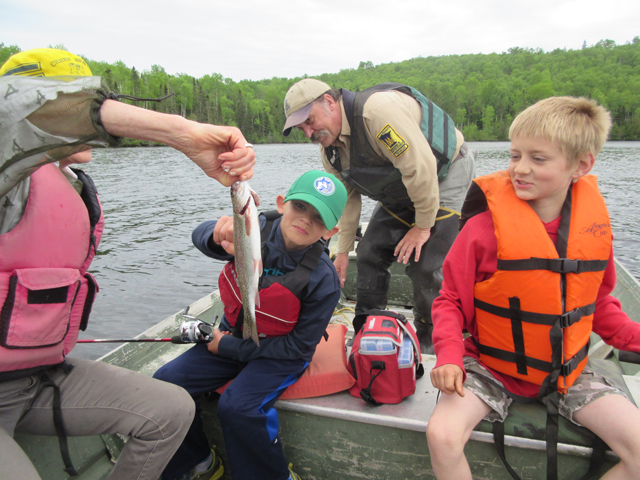 Cook County hosted a morning of fishing for kids in June 2017 at Mink Lake, as part of the annual Take A Kid Fishing Weekend by the Minnesota Department of Natural Resources (MNDNR). In Cook County, it is a collaborative effort with the United States Forest Service (USFS), MNDNR, Cook County Soil and Water Conservation District (SWCD), and Cook County Aquatic Invasive Species (AIS). It was a fun filled event where families went on a boat to fish, children made fish prints, families learned about AIS, kids received goodie bags, and families had a picnic lunch. There were 13 families this year and a special guest, Representative Rob Ecklund, who welcomed everyone at the start of the day and kick off the fishing. He also helped kids fish and assisted with getting fishing line out of trees. Thanks goes out to all the volunteers and the event sponsors: Coldwater Foundation, Clean Water Land and Legacy Fund and Arrowhead Electric – Operation Round-Up Grant.